Boeing quietly added a new system "to compensate for some unique aircraft handling characteristics." Updated November 17 explaining MCAS and electric trim override operation. When Boeing set out to develop the 737 Max, engineers had to find a way to fit a much larger and more-fuel efficient engine under the wing of the single-aisle jet’s notoriously low-riding landing gear. By moving the engine slightly forward and higher up and extending the nose landing gear by eight inches, Boeing eked another 14% improvement in fuel consumption out of the continually tweaked airliner. That changed, ever so slightly, how the jet handled in certain situations. The relocated engines and their refined nacelle shape1At high angles of attack the CFM Leap-1B’s engine nacelle generates its own lift. An earlier version of this story referred to the “higher thrust” effect of the engines. caused an upward pitching moment — in essence, the Max’s nose was getting nudged skyward. Boeing quietly added a new system “to compensate for some unique aircraft handling characteristics during it’s (sic) Part 25 certification” and help pilots bring the nose down in the event the jet’s angle of attack drifted too high when flying manually, putting the aircraft at risk of stalling, according to a series of questions and answers provided to pilots at Southwest Airlines, the largest 737 Max operator reviewed by The Air Current. “Its sole function is to trim the stabilizer nose down,” according to the system’s description to pilots, who were learning about it for the first time this week. 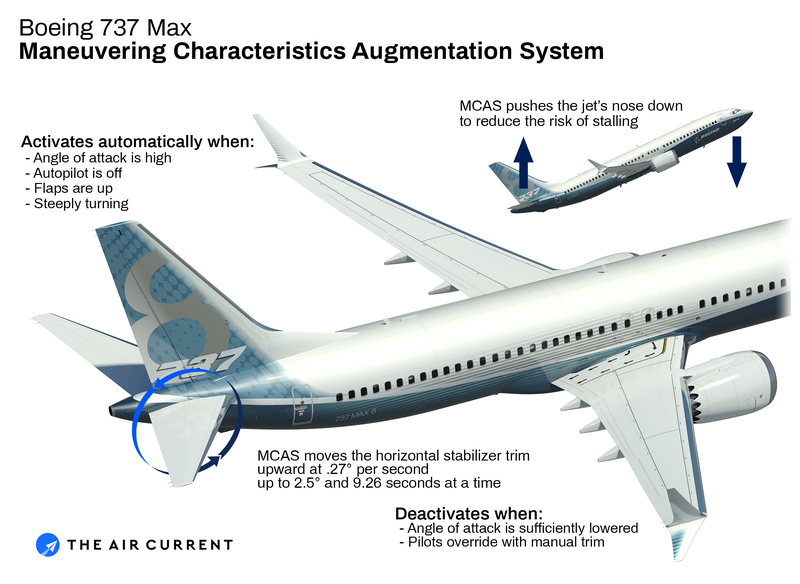 The system activates when the sensed Angle of Attack (AOA) “exceeds a threshold based on airspeed and altitude.” That tilts the 737 Max’s horizontal stabilizer upward at a rate of .27 degrees per second for a total travel of 2.5 degrees in just under 10 seconds. How much the stabilizer moves depends on Mach number. At higher Mach the stabilizer moves less, at slower speeds it moves more. The trim system under MCAS is not stopped by simply moving the control yoke. If the Max is at a high AoA — or its sensors erroneously believe that it is — “the MCAS function commands another incremental stabilizer nose down command.” The system can be deactivated if pilots trim the aircraft manually to override the MCAS’s attempt to automatically pitch the jet’s nose down. Normal electric trim control on the yoke can stop the MCAS-driven stabilizer movement, however MCAS will activate again within five seconds after the switches are released if the angle of attack is still sensed too high. 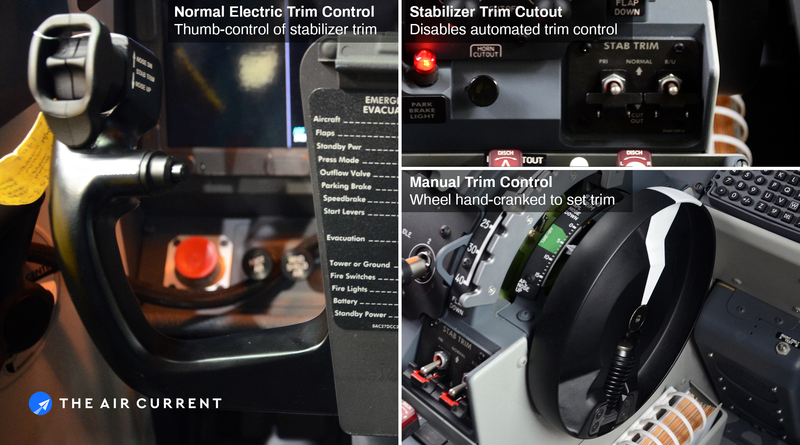 Pilots can deactivate MCAS and automated control of the stabilizer trim with the cutout switches and can hand-crank the trim wheels on each side of the throttle quadrant for manual trim. Boeing said in a statement that it is “taking every measure to fully understand all aspects of this incident, working closely with the investigating team and all regulatory authorities involved. We are confident in the safety of the 737 MAX. Safety remains our top priority and is a core value for everyone at Boeing. The existence of the MCAS system caught pilots and their labor unions off guard, intensifying the scrutiny on the aircraft in the wake of the October 29 crash in Indonesia that killed everyone aboard. The system isn’t mentioned in the flight crew operations manual (FCOM) that governs the master description of the aircraft for pilots and is the basis for Southwest’s airline documentation and training. The Southwest Q&A asks Why? Does this mean that one has to register to Boeing as an “above average” pilot before they tell vital facts and emergency counter measures for hidden system glitches? Boeing engineers have stated that they did not widely disclose the existence of the MCAS system, because they didn’t want to overwhelm pilots with excess data. From my perspective as a Captain who flies the MAX, I observe that the engineers sitting in their chairs on the ground have done a marvelous job overwhelming 189 innocents with the engineers’ arrogance and stupidity. If you’ve introduced a new system designed to exert authority over a primary flight control, well, that’s a nice thing to know. Retired flight controls engineer here. (FAA and NASA, but retired long enough that the MAX wasn’t on the horizon when I left.) Would this have looked to the crew like a trim walkaway? Do the manual trim wheels still rotate? Would the standard recovery from trim runaway have mitigated it? Great article! As a former NTSB and FAA human performance investigator I thought Boeing aircraft always provided more feedback to pilots than their Airbus counterparts, (movable yokes, throttles, etc.) It appears that with this new system Boeing decided to “leave the pilots out of the loop.” Furthermore, it sounds like pilots can override the system simply by making manual trim inputs. Obviously pilots need to be informed of this important feature. It hey had MCAS, it would prevent them from entering power-on stall then nose dive and crash like a brick. So MCAS is not a design fault or glitch in my opinion. Also, it is not true that 737 pilots are not trained for all sorts of pitch trim failures. They are well aware that when trim behaves unpredictably and out of pilot desired command trim can be override, manually stopped by holding the wheel or even completely cut off – that is what ‘stab trim cut off’ switches do. Boeing highlighted that procedures in the recently issued bulletin. Boeing could at least tell about MCAS in FCOM, thats for sure, let’s be completely honest! But real question here is why pilots fought long minutes with controls instead of simply cutting off this goddamned trim wheel, it must have been spinning around like crazy the whole time, against their command – even though they did not know about MCAS it should be recognized as a trim runaway issue that they, and any other 737 pilot, should train for. As a long time 737 captain I totally agree! The trouble with many pilots these days, (and especially from some areas of the world, hmmmm) is that they’ve lost the ability to do basic hand flying. Cutting the trim switches and stopping that uncommanded stab movement is a basic manoeuvre which every 737 pilot should know. Boeing don’t make it a must know, memory item for no reason! Any well trained, half competent pilot would have had no problem dealing with the issues the Lion Air 737 had. After all, it doesn’t take a particularly good pilot to fly a 737 on a really good day. Once things go even a little pear shaped, with bad weather or aircraft/engine etc problems, it’s a very different story. Lion Air have “the runs on the board” when it comes to incompetence, sad! Because there was no interface computer doing continuous self bite testing between the two systems and.latchin out the bad one with cockpit indication as Airbus would have.Remember the 737 NG that crashed short of the runway during autoland controlled by a faulty #1 rad alt ! !Same issue no auto switchover with no indication either Note the rad. Alt #1 was the only one that could.give input at the time now modified after big accident. I agree. Boeing should have stopped making improvements to the old 737 and design a brand new medium range aircraft replacement a la 787 design. I certainly understand is a matter of money as usual. I’m sure that what happened is that: All of a sudden and while the plane was flying at lo altitude for the emergency landing, the trim wheel started spinning fast and the plane nose came quick into a steep dive. The pilots immediately pulled the column control all the way back and applied maximum trust, but nothing changed and the plane crashed in only a few seconds. The pilots need more training. The MCAS system must also become more reliable and in any case it must be made sure that it CAN NOT be triggered by just a malfunctioning sensor. And something last but very important: When the pilots pull the control column all the way back and with all the physical power they have, it’s is very obvious that the plane is in great danger and they want it to pull up immediately!! So, all the automated systems that send the nose of the plane downwards or reduce trust, MUST BE automatically deactivated if the pilots pull the control collums all the way back. The software of MCAS must change according this fact. Nice article. I do understand that the MCAS is only there to work against a high attitude upset, however, there was something quite similar in the very old and venerable STS (or speed trim system) in the 737NG. Now, i am not boeing rated anymore so do not now if the STS is still there on the MAX or if it dies with the NG, but would really love to see the differences and similarities between both systems. I am puzzled because i have the impression that performing the memory items for a runaway trim would have saved the day so i understand Boeing behaviour.On the other hand the information at least in a basic format should have been in the fcom but again if you are not aware you perform your memory items for a runaway trim and you should be ok.
Latest news from the crash investigation shows that only 90 seconds after the plane took off and all the time until the time of impact,the pilots kept continuing fighting against MCAS. The system kept trimming the nose continually all the way down, and they where continually trying to trim the nose up and keep the plane safe. They didn’t think for just one second to switch down the two switches that cutt down the power to the motors that move vertical stabilizers. That would have saved the plane. The previous flight had the same exactly problems, the crew switched down the power, and continued the rest of the flight applying only manual hand treaming. The fixings did not solve the problem and the next day happened the tragic event. More training is needed for the pilots to learn how to overcome automated systems if they are mulfuctioning. As a retired experimental test pilot I’m incensed that such a powerful automatic pitch control system with the capability to override pilot control input could be certificated without any specific warnings in the flight manual or in mandatory training. And what design elements were in place to ensure that NO single, or even double, systems failure could ever lead to a loss of pilot control authority? Finally, what were the Company and FAA test pilots thinking to have certified the safety of this system without very specific warnings relating to it? Very good points! I am a Raytheon Human Factors Engineer, previously worked on our Air Traffic systems. I also wondered about the sell-off process and what the FAA thought of this. Possible that MCAS never came up? First things first. The stick shaker activated at liftoff. The right side stick shaker did not activate. What needs to be seen is the crew action for this scenario. As per FDR data released in the prelim report, the previous crew faced the same issue. Capt handed over control to F/O and cut out the stab switches. They also selected flap to stop MCAS from trimming down. The crew in the ill-fated aircraft did select flaps back to 05 and the auto trim down stopped but for some reason retracted flaps and the trim restarted. With limited information, its difficult to say what was going on inside the cockpit. Mcas is not new. It was part of the fcc on the ng. They just recalled that part mcas. It is still part of the fcc. amplifying the pitch up moment so it no longer can be compensated for by commands to the aerosurfaces. avoiding a stall is a secondary effect. A basically unstable plane augmented to stability by software is (again) IMU not certifiable. probably the reason why this was kept under wraps by Boeing. Where ever else you look Boeing would have PRed such a cludge to no end. Not here. MCAS is triggered in clean configuration. In flight 610 the pilot selected flap 05 to prevent auto trim. But at that instant the speed was around 300 kts and as a result the flap got retracted. The FDR data shows that the speed was always around 300 kts and flap extension was ruled out to prevent MCAS trigger using flap extension. The previous flight before crash had the same flight control problems but the crew switched down the power to the trim stabilizers and continued the rest of the flight with manual trimming. The fixings from the night crew of the mechanics did not fix the problem (as they thought they had) and the next day happened the tragic event. Pilots should be advised to return to the airport when they face serious problems.The previous flight crew should have discontinued the flight. The companies also must be advised to perform TEST FLIGHTS, without passengers, in every case that there is the smallest doubt that a technical problem or fixing maybe not was fixed as it should. NOT ALL airplane systems can be tested on the ground. Test flights is the only way to ensure 100% that a plane is working 100% with no problems. When I drive a new Prius with lane asist, similar to MCAS, it gently guides me back into the lane if I drift out. But it certainly does not take over control where I need to provide a hundred foot pounds of steering wheel torque to steer manually. This simple concept would enable the pilot fighting MCAS to provide AOA correction with a defective AOA sensor. I am sure Boeing Advance Technology Divisions was designed MCAS within years to analysis it, before put into the flight control system, and if we saw the B737 Max video advertising that could take off with 90 degrees, make every aviator wonder why and do civil aerplane fly in such climb performance? Boeing philosophy, always have pilot involve at every step of its aircraft operations, Normal, Abnormal and of course in Emergency. And of course practical of all operations were doing in Simulator Training with referred to FCOM.